The Laguna Beach Beach Arts Alliance hosted a candidates’ forum on Saturday at the Laguna Playhouse. About 80 people attended the forum. The mood was mellow, perhaps due to the coffee and donuts served before the forum began or the demeanor of former Mayor Jane Egly, who moderated the forum. Candidates Peter Blake, Ann Christoph, Jorg AKA Comrade Dubin, Toni Iseman, Sue Kempf, Cheryl Kinsman, Lorene Laguna, Judie Mancuso, Allison Mathews and Paul Merritt were given one minute to answer questions and microphones were cut off when they exceeded the time limit. When it happened, the speaker took it in good part. Question 1: What is the main reason or reasons you decided to run for City Council? Kinsman: “I’m a certified public accountant, and the reason I am running has everything to do with money. I am opposed to the sales tax [Measure P], which I think hurts our local businesses. I’m opposed to a bond for undergrounding in the canyon. During Kinsman‘s reply, S.T.O.P founder Jennifer Zeiter raised a banner and was advised that no political signs were allowed at the forum. Merritt also would like to slow down traffic on Coast Highway. Question 2: Where do you encourage development of artist/work live housing? Question 3: What portion of the cultural arts plan do you think should take priority? Iseman: “Well, the consultant that we’re talking about [AES that consulted on Arts Plan] – we have had a lot of bad ones – was a really good team, and they came to the conclusion that we don’t need a facility. We have enough; we just have to manage it. Question 4: People are talking about changes, how do you make changes, how do you force a change? Mancuso: “To make change, the first thing you have to do is identify what needs changing. So you reach out to your stakeholders – and your stakeholders are your community – and you ask what are the priorities? Once you’ve identified the priorities, you make a list and you prioritize that list. Merritt: He suggested the City should build bridges and work with Cox Cable, Caltrans and the Coastal Commission. Dubin: “Change City Hall, first and foremost. Streamline the process for people that are trying to develop projects through design review. We have to stop being the City that says it can’t be done or being reactive when people bring ideas into city hall. It’s time to end that process. Question 5: Tourism is vital to the success of nonprofit art organizations. How would you balance the needs of the arts and the residents? Mancuso: “The tourists add to all of our businesses, whether restaurants, T-shirt shops, or art galleries, I think we need to make it pleasant for visitors to be here at every level. He suggested that events for locals, including the arts community, could be held in the spring, fall and winter and leave the summer to the tourists. Blake: “I just can’t seem to find a correlation between a cultural visitor and how I would have to balance that with a resident. A cultural visitor is the ultimate visitor a coastal community can get, the person who is coming here and seeing an event at the Laguna Art Museum is a person that is staying in a nice hotel and spending money here. 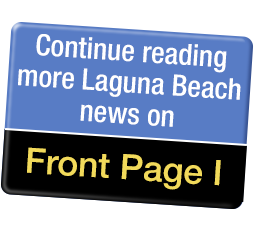 Iseman: “I don’t object to Visit Laguna Beach spending money to bring people into Laguna Beach, if they’re advertising in Sunset Magazine and not on the internet saying free parking in South Laguna. Kempf: “We need to enhance our reputation as an arts community to the outside world, but we do need to do something about parking. It’s a core problem. When we look at the statistics of people coming to Laguna for arts events, they are highly educated people. Day-trippers are something else. The people who come to the arts have money and spend money. When we talk about bringing people into town, we need to target the right people”. Kinsman: “I think what we need to do for both residents and tourists is finalize our downtown. There are a lot of empty shops, and it doesn’t look good. Our downtown specific plan right now is too restrictive. We are not allowed to have chains and let’s face it, chains are the ones who can afford the higher rent right now.